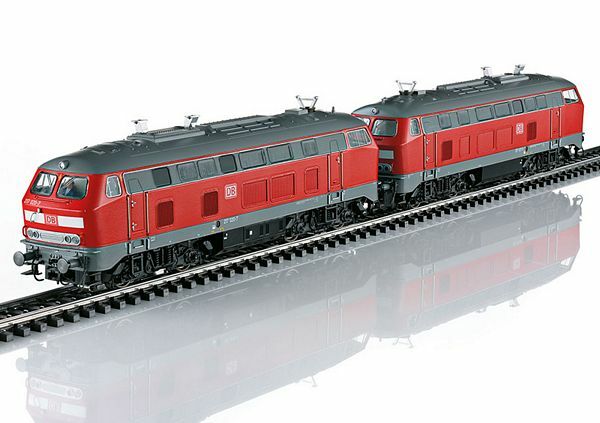 Prototype: German Railroad, Inc. (DB AG) class 217 general-purpose locomotive as a double unit. Diesel hydraulic locomotive with electric train heating. "Traffic Red" paint scheme. Exhaust hoods included. The locomotives look as they did in 2003. Model: One locomotive has an mfx+ digital decoder and extensive sound functions. It also has controlled high-efficiency propulsion. All axles powered. Traction tires. One locomotive is not powered. Both locomotives are permanently coupled together. Maintenance-free warm white LEDs are used for the headlights. The triple headlights and dual red marker lights change over with the direction of travel, will work in conventional operation, and can be controlled digitally. The cab lighting can be controlled digitally. There is a figure of a locomotive engineer in Cab 1. The locomotives have separately applied exhaust hoods. They also have metal grab irons on the sides and ends. They also have detailed buffer beams. Brake hoses that can be mounted on the locomotives are included. Length over the buffers per locomotive 18.9 cm / 7-7/16". Prototypical window and vent arrangement. Roof includes exhaust hoods for the motor and the diesel engine for train heating. Figure of a locomotive engineer in Cab 1 included. Class 217 as a Double Unit During the building of the regular production V 160, there were already initial thoughts about replacing the steam heating with electric train heating as part of emerging structural changes. In 1965, Krupp delivered road number V 162 001. In addition to the 1,900 horsepower motor known from the V 160, it also had a 500 horsepower MAN diesel motor for heating. This motor powered a BBC 3-phase generator by means of a gear drive. The output of the diesel motor for heating could be used however in the summer or with freight train service to boost motive power output. Shortly after that came road number V 162 002 in February of 1966 with an AEG generator and road number V 162 003 as the last unit in October of 1966. It had a Siemens generator that was flange-mounted directly to the diesel motor for heating. All three of the V 162 (starting in 1968: 217) differed from the V 160 externally only in the framed lengthened by 400 mm / 15-3/4" as well as the altered window and cooling grill arrangement. In 1968/69, Krupp delivered twelve regular production units like these prototypes, road numbers 217 011-022. Like road number V 162 003, they were equipped with a diesel motor for heating with a three-phase generator flange-mounted directly to it and also new hydraulic gearing for 130 km/h / 81 mph (140 km/h / 87 mph after subsequent changes to the brakes). Starting in 1974 road numbers 217 001 and 002 often served as braking locomotives on test and measurement runs as part of the proving trials of new motive power. Nothing changed on them right up to their retirement in the fall of 2010 (217 001) and the fall of 2011 (217 002). They were still available as required for test and measurement runs for the FTZ in Minden and Munich. All of the class 217 units were used mostly in freight service as early as the end of the Eighties. They changed in 2000 from Regensburg to Mühldorf, where they could prove themselves pulling heavy freight trains in the Southern Bavarian chemical triangle. At the end of 2011 the last of the DB class 217 units were taken out of service. Road number 217 002 was sold in the fall of 2012 to the BTE, road numbers 217 012, 015, 017, 020, and 021 to the Palatine Railroad, and road number 217 019 to the ESG. The latter has made itself useful since August of 2014 in a blue paint scheme, mostly in Southern Germany in construction site logistics.